I have been a big fan of G.K. Chesterton since college. At the time, I was listening to a lot of Rich Mullins’ music, and I read somewhere that Chesterton’s Orthodoxy was Mullins’ favorite book. I picked it up and devoured it. I had heard of Chesterton before, but my limited exposure had only informed me that he was handy with a quote, and also handy with the knife and fork. Reading Orthodoxy, I was impressed with his skill at using language, but I was also impressed with the joy he evidently took in writing, and his determination to see the world with gratitude. I quickly read his other popular books: What’s Wrong With the World, Heretics, The Man Who Was Thursday, The Napoleon of Notting Hill, The Club of Queer Trades, The Everlasting Man, St. Thomas Aquinas, St. Francis of Assisi, and most of the Father Brown Stories. I never read his Autobiography, however, until now. 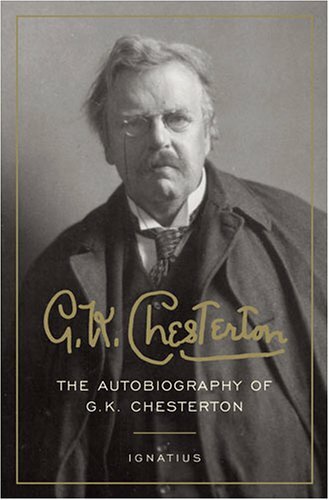 I recommend this book to all Chesterton lovers, but I recommend reading a different biography first. Chesterton was notoriously interested in ideas rather than facts, and that interest carries into his account of his own life. The book only follows the haziest chronology, and the name (though not the presence) of his wife, Frances, is entirely absent, by her own request. But it has beautiful prose, and is a joy to read. If you’re already familiar with the facts Chesterton neglects to mention, you’ll get a lot more out of it. I for one have never left off playing, and I wish there were more time to play. I wish we did not have to fritter away on frivolous things, like lectures and literature, the time we might have given to serious, solid and constructive work like cutting out cardboard figures and pasting coloured tinsel upon them (51). No man knows how much he is an optimist, even when he calls himself a pessimist, because he has not really measured the depths of his debt to whatever created him and enabled him to call himself anything (99). I have never taken my books seriously; but I take my opinions quite seriously (113). The truth is that for most men about this time [of the Boer War] Imperialism, or at least patriotism, was a substitute for religion. Men believed in the British Empire precisely because they had nothing else to believe in (145). Very nearly everybody, in the ordinary literary and journalistic world, began by taking it for granted that my faith in the Christian creed was a pose or a paradox. The more cynical supposed that it was only a stunt. The more generous and loyal warmly maintained that it was only a joke. It was not until long afterwards that the full horror of the truth burst upon them; the disgraceful truth that I really thought the thing was true (175). It was the secularists who drove me to theological ethics, by themselves destroying any sane or rational possibility of secular ethics (177). I am incurably convinced that the object of opening the mind, as of opening the mouth, is to shut it again on something solid (217). Religious liberty might be supposed to mean that everybody is free to discuss religion. In practice it means that hardly anybody is allowed to mention it (230). I have generally attempted, in a modest way, to have reasons for my opinions; and I have never been able to see why the opinions should change until the reasons change (235). Man seems to be capable of great virtues but not of small virtues; capable of defying his torturer but not of keeping his temper (239). I could not be a novelist; because I really like to see ideas or notions wrestling naked, as it were, and not dressed up in a masquerade as men and women (282). I have written several books that were supposed to be biographies; and lives of really great and remarkable men, meanly refusing them the most elementary details of chronology; and it would be a more than mortal meanness that I should now have the arrogance to be accurate about my own life, when I have failed to be thus accurate about theirs (303). It matters very little whether a man is discontented in the name of pessimism or progress, if his discontent does in fact paralyse his power of appreciating what he has got (328). A whole generation has been taught to talk nonsense at the top of its voice about having “a right to life” and “a right to experience” and “a right to happiness.” The lucid thinkers who talk like this generally wind up their assertion of all these extraordinary rights, by saying that there is no such thing as right and wrong. It is a little difficult, in that case, to speculate on where their rights came from; but I, at least, leaned more and more to the old philosophy which said that their real rights came from where the dandelion came from; and that they will never value either without recognising its source. And in that ultimate sense uncreated man, man merely in the position of the babe unborn, has no right even to see a dandelion; for he could not himself have invented either the dandelion or the eyesight (329–330). What has troubled me about sceptics all my life has been their extraordinary slowness in coming to the point; even to the point of their own position. I have heard them denounced, as well as admired, for their headlong haste and reckless rush of innovation; but my difficulty has always been to get them to move a few inches and finish their own argument (331). Of all the other systems or sects I know [besides Christianity], every single one is content to follow a truth, theological or theosophical or ethical or metaphysical; and the more they claim to be universal, the more it means that they merely take something and apply it to everything (332). Existence is still a strange thing to me, and as a stranger I give it welcome (334).